Mussels might seem a bit daunting to make at first but they are actually a great midweek option. They are ridiculously quick to make and at just £3.50 for a 1kg bag they are a cheaper option than chicken or mince. If you omit the spaghetti they are just 6pp which is a great starter option but add some spaghetti and for only 10pp you get a gorgeous and filling dinner! If you have a few pro points left for the day you could even treat yourself to a WW petite pain! Fry garlic, chilli and onion in 1KAL for a few minutes until soft. Add a small glass of white wine, tin of tomatoes, tomato puree, sugar and seasoning and simmer for a few more minutes. At this point pop your spaghetti on. Add the cream and half of the basil leaves to the sauce and simmer for a minute. Next tip in the cleaned mussels and give them a stir. Put a lid on the pan tightly and let the mussels steam for 3-4 minutes until all of the shells have opened. Once your spaghetti is cooked, drain and toss into the mussels. 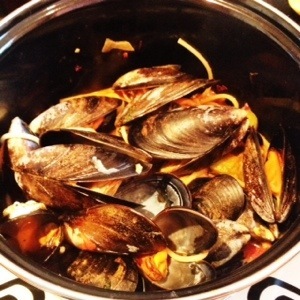 Serve in bowls with a scatter of basil and discard any mussels which don’t open. Finish with a squeeze of lemon!